4. 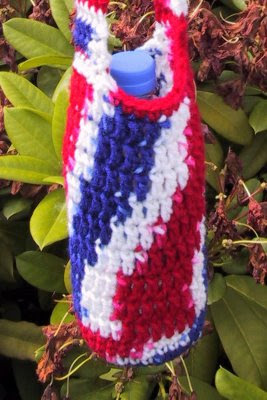 The length of the strap may seem short to you, but once the bottle full of water is in it’s going to stretch A LOT. You can make it longer or shorter if desired. 5. Holds a 20 ounce bottle. Join the working end of the strap to the opposite side of the holder. Do this by skipping 10 sts and holding the right side of the strap against the right side of the holder work a slip stitch though the strap and the holder in each of the next 5 sc. Just found your site. 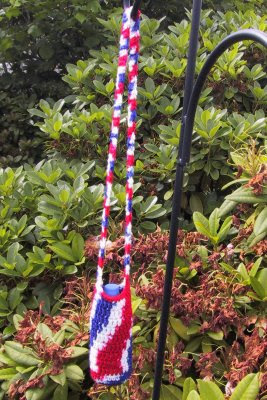 Will be making a couple of water bottle holders in red, white,and blue to take to Wash DC rally. Like the one with beads also. Don't know if I will have enough time to do any squares for Charity but will try. I have a lot of yarn and it sounds like a project I would like to do. Will be in touch if I can contribute. Thanks again for you site.